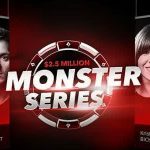 The Winning Poker Network’s High Five Series makes a welcome return next week to conveniently fill a gap between tournament series on other poker networks. Fans of big online poker tournaments are not short of action at present. Up until the end of this week, 888Poker and Party Poker are both running valuable tournament series, and – once these have finished -satellites get underway for PokerStars´ SCOOP 2019. However, if you are going to miss the buzz of playing in big tournaments with valuable cash prizes, you might want to try out the High Five series on the Winning Poker Network (WPN). The High Five series consists of five value-added tournaments on each of five consecutive days running from next Wednesday (April 17th) to next Sunday (April 21st). Between them, the twenty-five events have guaranteed prize pools exceeding $1.3 million and, with buy-ins starting from just $1.05, there are tournaments to suit players with every level of bankroll. Furthermore, there is an excellent mix of tournament formats in the schedule. The primary not-to-be-missed tournament is the High Five Main Event on the final day of the series at 4:00pm (all times ET). 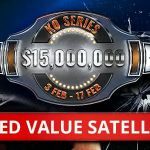 This $450 buy-in tournament has a guaranteed prize pool of $420,000 but is being supported by a superb satellite schedule, so the actual prize pool will likely exceed $500,000. However, if you play in this event, be prepared for a late finish. Late registration for the High Five Main Event is open for 4½ hours, meaning you can still jump into a seat as late as 8:30pm! Players who have to get up for work on Monday morning have the option of playing in the earlier “Warm Up” tournament which starts at 1:00pm. This tournament has a more modest $109 buy-in, but still has a very decent $250,000 guaranteed prize pool. Alternatively, for players with more modest bankrolls, there is a $22 buy-in event at 2:00pm with an exceptional guaranteed prize pool of $80,000 (exceptional for a $22 buy-in online poker tournament). One of the things we like about the High Five series is that not all of the high-value tournaments are saved until the final day of the series. 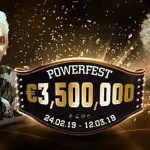 A $100,000 guaranteed 6-Max tournament is the highlight of the opening day, and the big prizes continue on days two and three of the series with $80,000 and $50,000 guaranteed tournaments appearing on the schedule. There are also plenty of novelty events in the series – including a 6 Plus Hold´em tournament and a NL Omaha Hi/Lo KO tournament. If you are already playing at Americas Cardroom or Black Chip Poker, you have the opportunity to take advantage of a 50% High Five reload bonus up to $420 provided you make your qualifying deposit this week between April 10th and April 14th. When you are making your qualifying deposit, be sure to enter the High Five reload bonus code “HIGH” in the cashier section of the poker client. The bonus will be credited to your account automatically and the usual clearance rules apply. 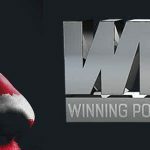 If you are not already playing at Americas Cardroom or Black Chip Poker – the flagship sites on the Winning Poker Network – you currently have the opportunity to take advantage of a 200% first deposit bonus up to $1,000 if making your first deposit using one of sixty accepted cryptocurrencies or 100% up to $1,000 if making your first deposit using a credit card. To take advantage of this opportunity, follow our links to Americas Cardroom or Black Chip Poker and enter the bonus code “PNREPORT” in the bonus code field on the first page of the registration form.